Painting — of course I chose green. Lighter than the other rooms, though. 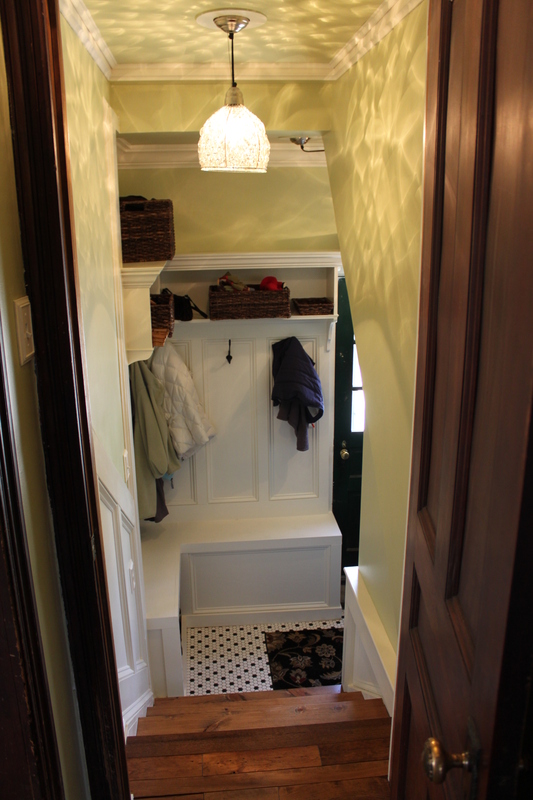 We’ve finally finished the mudroom, or side entrance. Well, sort of. Bill has done everything in this room except just a bit of the painting. I have done very little except pick out the lights and color. His work is extraordinary, I think. I chose to paint it green to keep the house in theme. 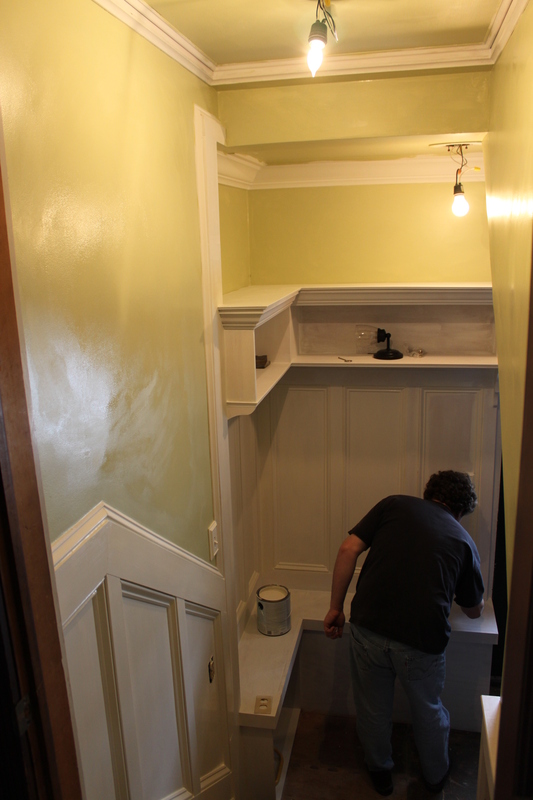 All of the hallways will eventually be green as well with the white trim where appropriate and the cherry downstairs. As you can see, Bill installed an additional top light so that the entrance would be brighter. I chose these cool wire and glass pendants. The tile was a no brainer for us. We both knew what we wanted separately and I think the finished floor is so worth it. If we ever do another bathroom, we’ll use the same tile. 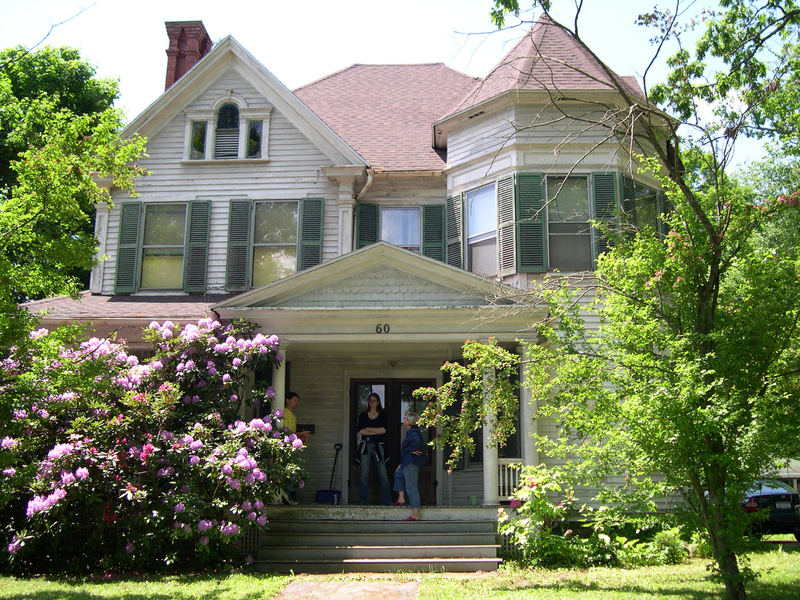 It reeks of old house, doesn’t it? We have a bit of paint to touch up and the grout the floor, but otherwise, it is complete and we’re using it. I will likely repaint the door to the basement something to match the entrance and formalize it a bit. The purchased baskets match the other baskets I have throughout the house, in almost every room. I’m a big basket for storage kind of person and have found them both practical and long lasting. Love seeing what you’re doing to our old house. Lived there from 1975 to 1989 when I came out west. My parent sold the place in the mid-1990’s. So glad you found the blog, Chris! We are really enjoying the house and trying to bring back life to the gardens and light inside. Let us know if you ever come back to NY for a tour.